I listen to music 90% of the time I’m in the car…and the radio rotation is getting boring! For a little variety this summer, I’m making a project of listening to more music from around the world. And thanks for pre-made playlists on Amazon, Spotify, etc, I don’t have to dig much to get a great variety of artists within the different genres. Here’s some genres and artists I’m listening to—I hope it inspires you to find something new as well! 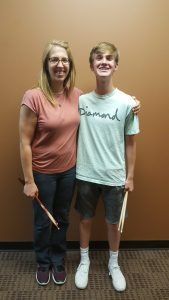 Landon has been taking drum lessons with Laura Lee for 2 years and been in the High School Rock Band for the last year and half. Landon has taken ownership of his drum practicing and musical progress, and grown exponentially because of that. Congratulations, Landon! Why did you choose to learn drums? They’re fun. I like playing fast and hearing how it gets better after I’ve practiced awhile. What has been your favorite performance? When we played at the fireworks event at Evangel last year—people said it sounded like we were on the radio! Any tips for young musicians? Don’t give up, chase your dreams! Our student bands have done an amazing job this summer – come cheer them on and be inspired at their end-of-summer concerts! Concerts are at Evangel Church, room 123 (lower level). Sign up today for your fall music lessons! Call (816)419-8526 or click here to request more info! In late August, we get a rush of new students and teachers’ schedules fill up quickly. Contact us today to get the best lesson time for your schedule and start in the first weeks of August. ← WHY do we teach music?